Richard Branson needs no introduction. But for Malaysians, he would probably be best remembered for donning a skirt and a full face of make-up on AirAsia flight to Malaysia back in May 2013. He did it to honour his Formula 1 bet with Malaysia's F1 team and AirAsia owner Tony Fernandez. In the renewable energy industry, his name would quickly come up as one of the wealthy men making investment in renewables. Necker Island, the Caribbean Island owned by him, is reported to be shifting to 75% percent renewable energy by the end of 2015. 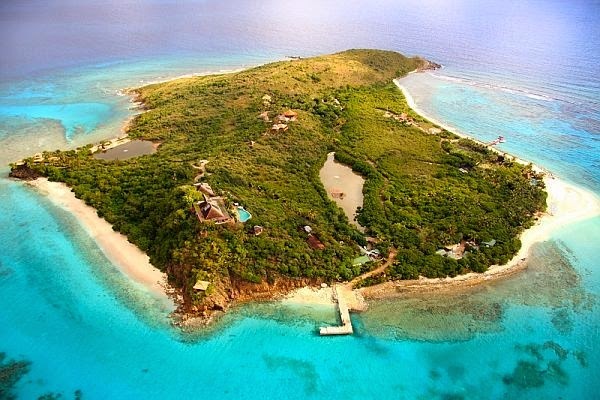 Necker Island to be powered by 75% renewable energy. Photo: Virgin Hotels Group. Virgin Group chairman Richard Branson has struck a deal with NRG Energy to build a system that manages wind, solar and diesel power on the 74-acre island. Electricity on small Caribbean islands is extremely expensive because they must rely on imported oil to power generators. According to NRG Energy, people on the island are paying 40 to 55 cents per kWh compared to 6 to 20 cents in the US. By shifting to solar and wind energy his energy costs would be cut by 40%. Switching to 100% renewable was too expensive because of the cost of storing wind and solar energy in batteries, but Branson believes one day, once storage is better, it would be possible to go 100%. The project is part of the Ten Island Renewable Challenge, in which Caribbean islands will attempt to end their reliance on fossil fuels. Energy cost for off-grid system such as those on islands is very high. I remember some years ago I was involved in working out a cost to supply power from diesel generators to Sabah's Manukan Island and we failed to convince the resort operator with the cost. I guess the operator is still maintaining its own generator sets, combined with Sabah Parks' own unit. With cost of solar panel dropping fast, I believe it is high time the resort operator (Sutera Harbour) re-visit its power supply system there. Going renewable could be rewarding.